So my last post was entitled “Survived my first week” and then you didn’t hear from me again. I guess that’s about as descriptive as I can be about life in my new job. Still loving it, but it has been busy! I took yesterday (Friday) as a comp day for the fact I’d worked most of the last weekend and realized it was probably the third full day off I’d had since I started five weeks ago. I’m slowly learning how to control my schedule better. Yesterday I spent running some errands and doing some Christmas decorating. I decided to bag doing housework and such today (which has also fallen behind a bit) and focus on reading Michelle Obama’s Becoming (loving it! ), and getting back into my sewing room. Unfortunately, the sewing room part has been a bit frustrating. I have been sadly reminded of why I gave up doing blocks of the month. The first one I tried many years ago kept sending me incorrrect sizes of fabric to cut my pieces out of, and I ended up giving up and cancelling about four months into it. This time around, last year I bit on the Cotton Cuts puzzle mystery quilt. I loved the fabrics and the idea of everything being die-cut so all I had to do was assemble seemed tailor-made for my busy schedule while I was finishing my doctoral work. I spent about 15 minutes going back through everything, laying them out in the order of the months I received (I did always keep the instructions each month, thank God, or I’d have been totally lost), and came to the conclusion that nope, I was never instructed to make blocks labeled F. Also fortunately, the last layout “clue” includes a list of which months we were supposed to make which blocks, so I could pinpoint the exact month that went awry—yep, the one I kept getting the wrong sized pieces for. Strangely, though, my instructions for month 6 are labeled for the correct size quilt I’m making, but the blocks are distinctly not what’s needed. Stranger and stranger. I’ve sent yet another email to Kim at Cotton Cuts with photos of the two blocks I ended up with and instructions for month 6 to point out how messed up all this is, and then said that I had originally been thinking I’d join the new BOM mystery puzzle quilt that just opened this week but am now hesitant to do so because of these problems. It’s frustrating that something I was enjoying should have this kind of an end-story. Especially frustrating that I get so little time to sew and I was stymied at the get-go. So I have it all laid out on my design wall with big gaps where block F is supposed to go. I can certainly start sewing together the pieces that form the borders and such so I’m ready to finish it when I get the corrected month, but at this point I’m already a little worried they’ll be out of the fabrics needed. Fingers crossed I won’t end up with a slew of orphan blocks all for want of month 6. At the moment, I’m also not keen on the fabric they sent for the binding. I’m going to wait until I get everything assembled and then decide final steps. But that’s a small thing. I would just love to finally be able to have a finish under my belt, for the first time in months! Meanwhile, I am happy to say that my desk got assembled and my office is finally put together! The panoramic style makes it look a little bigger than it is, but it’s a comfortable space for me now. Note the space heater—the radiator under the windows is finicky and often needs help. The quilt on the wall is one my mother made. I don’t know the origin story although it’s a sampler that smacks of a block of the month or class or something. But one of the blocks is a church and most of the rest are either crosses or biblically-related blocks (ie Jacob’s Ladder), and the office really needed some warmth and color in it, so it seemed fitting. And no, I can’t put an area rug under the conference table because it’s strategically placed over a large old-fashioned metal outlet box that protrudes up from the middle of the floor. I do now (after this pic was taken) have a small quilted Christmas table-topper on the round wooden table at the side. Eventually more little bits and pieces may make their way into the office but for now I’m comfortable for working and have room for people to come visit and drink tea or coffee with me. And that’s happened a lot! After 17 years of working from home, I have to confess that I’m enjoying having an office. Now, back to my sewing table and figuring out what I might actually be able to accomplish today, that’s not under the control of external forces! So I was all ready to “off” another jelly roll by whipping up a second jelly roll rug today. I even had in my head where it might go in my house. And, of course, since I’d already made one, this second one would go ever so much faster and turn out even better. At least in Sandy’s Make-Believe World it would, and that’s a happy place to live. But I never got the chance to find out. I started my sewing retreat day this morning by pulling a jelly roll out of my strip drawer that’s been in there at least eight years. Remember Moda’s Portobello Market from 3 Sisters? It was all the rage back then. I figured I’d had it so long and had never found a use for it that I might as well whip it up into a rug. As I was pressing the strips (those darn wrinkles in the fold again! ), though, I totally fell in love with the fabric all over again. I kept trying to picture it as a rug and thought, “I just can’t do that to these strips!” Too many of the gorgeous prints would totally disappear. So after I got them all pressed, I pulled one of my many jelly roll pattern books off my shelf and flipped through it for awhile, and now this is happening. I’m using another fabric that’s been in my stash for eons as the background. All in all, it feels good to be using up some fabrics, especially ones that have been haunting me for so freaking long. Of course, this is going to take longer to finish than a rug would. And, of course, I’m totally ignoring all the UFOs I’ve already got stacked up. I think I’ll be making besties with a long-armer soon to knock out a bunch of those UFOs. It’ll be money well spent! I do still plan on making another rug—but I think I’ll use a bunch of my scrap strips on it instead and focus on color designing rather than just using a packaged jelly roll. Might be more fun, even. We’ll see. Meanwhile, Auggie had a couple of days at his new doggie day care this week (one only 5 minutes from my house), getting ready for when I’m back to work next week. The day care owner had told me that Tuesdays and Thursdays were her “puppy days” and Augs would probably find lots of friends to match his energy levels, so that’s what I’m shooting for. Once I’m at work, though, it’ll all depend on my schedule in any given week. He doesn’t need to be in every day—I’m mostly doing this to burn his energy so he’s not pestering Old Princess Doggie (who just turned 14 a couple of weeks ago) out of boredom. I can alternate days because it takes Auggie a full 24 hours to sleep off a day in day care, LOL. 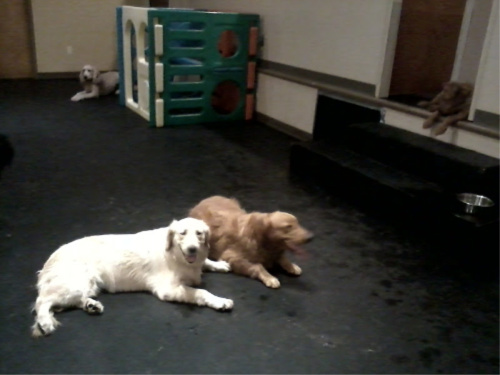 The owner texts pictures of the pups every afternoon. After several pictures of these two wrestling, I particularly enjoyed this one where Auggie (right) and his new buddy have clearly worn each other out. Yay! Speaking of which, time to go pick my day care doggie up, bring him home, and let Princess Doggie spend 10 minutes sniffing him. Basically, Auggie being in day care is also bringing Spencer some in-home entertainment for her nose. 90% caught up on Cotton Cuts BOM! The one on top is the one I’m waiting for the missing pieces; I think it’ll take me 15 mins to finish once they arrive. On to the next project! Too bad I didn't get this done in time for "Making It Monday" post, but maybe I'll have more progress to show next week. I finally got my embroidery out again! Yes, I'm still plugging away at the Postcard Cuties Halloween Block of the Month embroidery kit that I should've had done by last Halloween. But there are more Halloweens where that one came from. I'd actually gotten it mostly done several (ahem--weeks? Months?) ago. I only had a few little bits to finish up, so I got it done on one lunch break yesterday. It's hung out in its hoop for awhile so it'll take some serious pressing to get it back into shape. But it's done! I do find it helpful to state boldly--sometimes rashly and foolishly--all those things I seriously think I could actually get done over a weekend. And then at the end of the weekend, I generaly look back and say with some sheepishness, "Well, at least I got this one little thing done. That's something." Here in the U.S. it's the 4th of July weekend. For many of us, that means we have Monday off. I also had slightly-early-dismissal today (Friday). Even though it was only about 90 minutes early, it still feels like a nice way to get a head-start on the weekend. We'd originally planned to have people over Monday but as it turns out, we're going to be meeting my son for breakfast and then maybe going to Genesee Country Museum for their festivities (including a swearing in ceremony of new citizens--always a highlight). Since we're not actually having people over and I don't have to prep for a party, that means woo! Sewing time the rest of the weekend! First: I plan on finishing the Catch-All Caddy. It's been in this state since last weekend. That does actually represent good progress made last weekend, but obviously it wouldn't catch or caddy much in its current state. Also: I plan on getting the binding done on the Jacob's Ladder. Miles. I have miles to go. But our family is in the midst of a Stargate Atlantis binge so I've been to working on this all week while watching the Atlantis crew fight off the Wraith. Here's to hoping we watch enough TV the rest of the weekend that I've got it done by Monday! Finally: I'd really like to get started on putting together the first blocks of my embroidery BOM. I want to finish the little Christmas snowman guy I'm working on before starting the embroidery on this one, and I will get back to him once I get the binding done. (He's a "handwork in front of the TV" project.) But I need sewing room time to get the blocks for the BOM together and prepped for embroidery so I'd like to do that this weekend when I have more hours in the day available to me. By the way, I've also started thinking through my other new Halloween embroidery project. So that's a possible other endeavor this weekend, depending on time. Thanks to Trisha who turned me onto Urban Threads (see the Quilting for the Rest of Us Facebook page for that conversation), I bought a really wonderful Art Nouveau Witch design. Love Art Nouveau. This Halloween design is seriously classy and SO right up my alley. I've pulled out my tracing paper and colored pencils and am starting to think through thread choices. I printed a picture of an Alfonse Mucha painting to use for color inspiration. (Mucha's a fave.) I might toss into the weekend schedule a trip to an LQS that I recall having some great Art Nouveau/Art Deco/William Morris fabrics to see if I can find some borders I could use on her and blend that with color inspiration from the Mucha painting. I did find some pretty nifty possible border fabric from Fat Quarter Shop but really don't need/want an entire half a yard of it, so I want to see what I can get at an LQS first. Unfortunately, said LQS is about 45 minutes away so it would take a big chunk of sewing time out of Saturday, so we'll see what I feel like when I get up tomorrow morning. So, let's see what happens this weekend, shall we? Yesterday I got the first couple of installments of the embroidery Block of the Month (BOM) that I signed up for at The Quilt Block, Inc., when I was in Exton, PA, in April. Woot! I ended up getting month 1 and 2 at the same time due to some delays around getting my payment info to them, etc., which is part of the fun-tricky part of doing a LQS BOM from a distance. Still, we worked it out, and it's all good. It was a kick getting a box filled with goodies! The BOM is "Postcard Cuties for Halloween," from Bunny Hill Designs. My package included all sorts of great stuff to get me rolling! Even candy corn for a mid-project sugar fix! There's a jelly roll of fabrics to work with--Moda's Spooky Delights by Bunny Hill Designs. I do the cutting for each block as I work on them, and it looks like I can choose which fabric I want to use each time, so that'll be fun too. The only thing I'm a little worried about is whether I'd end up with two fabrics sitting next to each other in the finished wallhanging (which would bug me no end) so I may end up, for simplicity's sake, just following her picture. That's not normally like me, either, but much of the time I'll be working on this I'll be deeply enmeshed in work travel and schoolwork again and won't want to unduly stress myself out for what's supposed to be a fun project. The package also included some Tulip embroidery needles. This is a Japanese brand made in Hiroshima. According to the packaging, they're made in such a way as to make them slide more easily through the fabric. I bought some Tulip needles when I was at the shop but I made the mistake of opening the package and dumping them into my usual magnetic needle case with all the rest, so I have no idea now which is which to compare. I'll keep these needles separate with this project to make it easier for me to get a feel for them. And then there's the embroidery thread--everything I'll need for the project. This is Cosmo embroidery floss, another product from Japan. I noticed that it's also sold on the Bunny Hill Designs website so she must be a fan of this floss; hence, it's use in her project. I'm not familiar with Cosmo, but since it's from Japan, and since Bunny Hill Designs is Australian, I'm thinking maybe Cosmo is more common in Australia...? Any of my Australian/New Zealander buddies want to comment on that? I'm looking forward to using it to compare it with DMC and the other threads I'm used to working with. EDITOR'S NOTE: Error here--sorry. I had Bunny Hill Designs and Lynette Anderson Designs mixed up in my head. Bunny Hill is not in Australia, Lynnette Anderson is. So Australian/New Zealanders would have no more reason to be familiar with Cosmo thread than I do! And just to be extra nice, they included a water soluble marking pen. I already use this type and really like it, so I'm glad to have another! Month 1 will be fun--I get to start out embroidering bats. Woot! I need to make five bat blocks altogether, but it's a really simple design so I don't think it'll take too long. I will have to practice my satin stitch a little more--I've not gotten that one really smooth yet and it's used for the bats' eyes. The bats are scattered throughout the finished wallhanging on that orange dot fabric included with the package. The official first block includes a cat and spider (on the off-white background). It's got a little more going on, especially in the satin stitch department. If I'm not good at that satin stitch now, I will be by the time this puppy is finished! Month 3 comes in July, but I do have a few other projects I really ought to get done before starting on this so I may end up with Month 3 arriving before I've managed to get both 1 and 2 done. I'm determined not to fall too far behind, though! My guild had a sew day today and although I didn't feel like I could be gone an entire day, I put together a quick embroidery project I've wanted to get at for awhile and stopped by for about an hour or so. It was long enough to get my social fix with my quilty peeps and it was good motivation to finally get these little puppies underway. I have two identical little kits that I picked up at one of my LQS a few months back. It's from Lynette Anderson's Sweet Christmas Ornaments patterns. There are 12 designs in all and you can choose to make a wallhanging out of them or use them individually as ornaments. I think I bought these right after Christmas and they only had a few of this one design displayed. It's possible they'd started out with the whole set but sold out of most of them before Christmas. I didn't mind picking up two of the same: I thought they'd make nice last-minute gifts and/or I'll keep one/give one, or something. Undecided. The kit came with the design, fabric strips and squares to trim to size, and a wooden hat button. I'm using my own floss. I got both of them sewn together and traced before heading to the sew day, then I got partway through the embroidery on one of them while I was there. It's been so long since I've touched my embroidery that I had to re-start my stem stitch three times because I totally blanked on how to get myself going. Once I worked that out, though, it was a relaxing hour just hanging out with my friends and doing some simple stitching. Monday Musings: UFO Sightings, Part 1--Just What Is a UFO? So it would seem that some of you appreciated the 5 Ss posts that I've done the last few weeks--maybe some of us are feeling the pinch of being a little less organized than we'd like. So I'm thinking I'd like to keep with that theme for a bit, but explore different facets of it. As usual, stuff I talk about on my podcast and blog are things I'm addressing (or feeling the need to address, anyway) in my own life, so I'm talking to myself as much as to anyone else. I've mentioned that I had a sudden alien invasion in my sewing room. What to my wondering eyes did appear but something like 17 UFOs. Really? When did that happen? Leave fabric alone for long enough and it gets up to shenanigans, apparently. So, based on that, and on comments some of you have made when I've been talking about my UFOs, I'm going to do a few posts on what I've learned about addressing those alien invasions in your own life. Week 1: Define for yourself, "UFO"
We all know what a UFO is, right? "Unfinished Object," or so they say. But what, exactly, is an unfinished object? Turns out there's as many definitions for what warrants the definition "unfinished" as there are quilters not finishing things. I once read an article or a blog awhile back--don't remember specifics anymore--written by someone who defined her UFOs to include quilts she'd even just thought about doing. 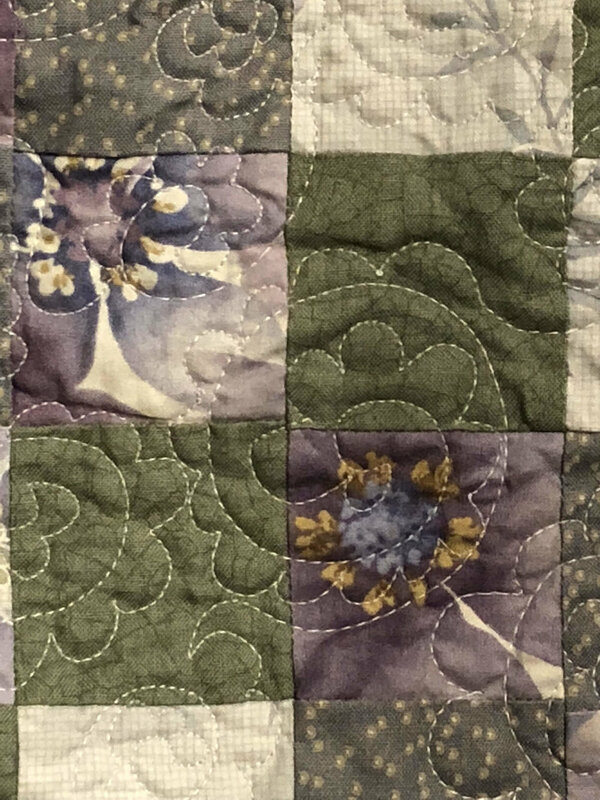 In other words, she may not have even bought fabric or designed it on EQ or sketched it in a notebook, but it was in her head as a quilt, therefore the fact she hadn't made it yet rendered that quilt as unfinished. Technically, I suppose that would be true. But if I were to be held accountable for every quilty thought that passed through my mind, well...I'd just throw in the towel and call it a day right now. Some people include PIGS (or Projects in Grocery Sacks, an acronym which really geolocates it's users to those who live in parts of the country who call grocery bags "grocery sacks," as here in Western NY it would be PIGBs, which is virtually unpronounceable); these projects are those for which you have a pattern or design and you've collected all the fabrics for it--it's all sitting neatly in a bag or a bin awaiting your attention. And waiting. And waiting. Some quilters include WIPS (or Works in Progress); these are projects you're currently working on. They've not yet started collecting dust on the shelf, but are still at least more or less in current rotation. For me, I made some judgment calls a few years back and came up with this working definition for myself: A UFO is any project in which I've already made the first cut, and which has dropped off my mental radar for any number of reasons. In other words, I don't choose to count PIGS. My rationale for that is that I can always repurpose the fabric if I lose interest, so just because I've thought about doing a particular design and put together a particular collection of fabric for it, doesn't make it a UFO. I haven't actually cut into that fabric yet, so I've never officially "worked on" the project to make it now be something I haven't worked on in awhile. I also don't count WIPs because, by definition, those are still "in progress." It has to have been languishing on my shelf for some period of time. I've never strictly defined how long a period of time it needs to have been out of rotation; it generally has more to do with whether it's fallen off my mental radar or not. If I look at something and think, "Oh, yeah, I really need to finish that," it means it's dropped off my radar, even if it was only waiting for me for about three weeks. That makes it a UFO. I don't count quilts I've dreamed up. That's just crazy talk. So this week, if you want to play along, work on your personal definition of what you actually, personally, consider a UFO, if you haven't already done it at some point in your quilting career. Don't just take someone else's definition for it--use a definition that works for you. You might even want to write it down, maybe hang it over your cutting table or something, live with it for a bit. Does it feel right to you? When you're ready, share your definition here! Annie Unrein bag: This got completely back-burnered this week as I have two time-constrained projects on the docket so I focused completely on those. Complete mug rug for swap: I haven't completed it yet (sorry, Kerry!) but I've made progress! Unfortunately, what I chose to do is somewhat time-intensive. But I think it'll be fun when it's finished. 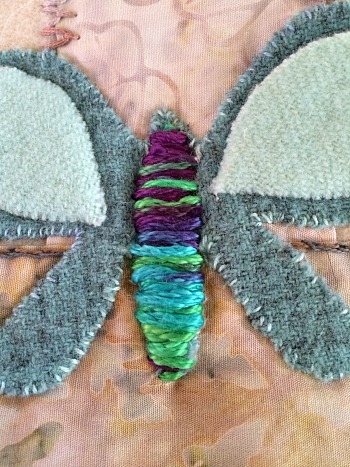 Complete three butterflies on Sue Spargo project: I'm now using stitches from a different Craftsy class (more on that in a future post), but haven't completed three butterflies yet. Again, those time-constrained projects made everything else take a back seat this week. I'll be bringing this with me on my work trip. Make block for friend's quilt: I'm doing some embroidery on it so it's a long process. I'm writing this post on Saturday and scheduling it to post on Sunday, as I'll be driving most of the day Sunday (see afore-mentioned reference to a work trip). I'm actually hoping to get this block done before I leave; if not, it'll be coming on my trip with me. Get my friend's block done. Make progress on the mug rug. This will be my primary focus on Saturday if I haven't managed to get to it before that. I really want to get it done, Kerry! Complete two butterflies on butterfly project. I knocked it down a butterfly due to my lack of time this week. Still, I think this could be within reach. Complete two Craftsy classes. One is the second embroidery class I mentioned above--a few more stitches and I'll have completed the class, if not the butterfly project; the other class is one I'm just watching to get a feel for techniques, no class project involved. I've only got a couple of lessons left to watch and I'm planning on doing that while I'm in my hotel. I can be embroidering at the same time--way to do the two-birds-one-stone thing! That I really am loving me some embroidery. That all those wonderful, funky threads are like candy. That adding some beads is a dangerous thing. How getting fiber art books out of the library can seem like a penny-wise move. Until I realize I really want to own the book. How nice it was to be able to start playing fetch with Doofus in the backyard this week. That he and I both need to get into better fetch shape. Winter was rough on both of us. How I'm sorta looking forward to my work trip next week because I know I can take my embroidery with me. I think I've done a WIP Wednesday post maybe twice in my blogging life. But here it is. I have something to say this week! I'm pleased to announce I finally conquered the whole "sewing on vinyl" thing with the Anne Unrein Everything in It's Place bag. In my last podcast episode--I think, or maybe it was a recent blog post, can't recall exactly--I was grousing about the trouble I was having with thread breaking when I was trying to sew gussets in strips of vinyl that will eventually become the pockets. After reading some blogs on the topic, and then a little trial-and-error myself, I finally hit on the combination that worked for me: Leather sewing machine needles and thinner polyester thread. Using a 90/14 Schmetz leather needle with a Superior Threads Bottom Line (bobbin weight) poly thread in my top and bobbin, I finally got all the vinyl pocket gussets sewn with nary another break. I think the bobbin weight thread will be strong enough, but it all gets sewn again anyway when you install the pockets on the pocket pages, and I'll be using a 50-weight thread for that, so it'll be fine. And then I had to install umpteen-million zipper pulls on a zipper-by-the-yard. This was a struggle I'd already had to conquer back when I had to do the mesh pocket a couple of weeks ago. Now that I know how to get that stinkin' zipper pull on...I can't say it got a whole lot easier. But at least I got it done without throwing a single one across the room. I measure success a little differently these days. That being said, I really should've watched the lesson all the way through before I hauled off and got started on the zippers this time around--I only saw after the fact her very helpful tip about putting all the zipper pulls on first and then measuring it out, sewing and cutting the zipper lengths needed with the pulls already installed. Probably would've gone a lot faster, as it's easier to put the zipper pull on using the fabric tail of the zipper rather than on the cut end. Finish Anne Unrein's Everything in Its Place bag from Craftsy class--maybe. At least, make significant progress. Stitches--ummm...I did watch one lesson. I'll be sitting down with my embroidery tonight for the first time in about 10 days. So tonight I'll have some progress, but nothing to report here. 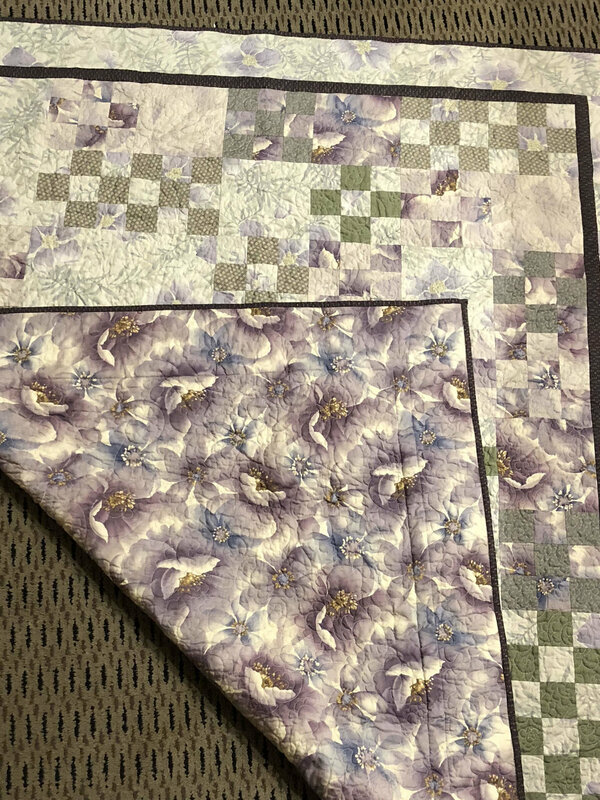 Basically, I didn't make much progress this week on quilting projects; I did, however, do a lot to set myself up for better progress in the future. You'll need to listen to tonight's podcast episode to hear why. That being said, while I was listening to my own episode back again prior to posting, I did make some progress on the EIIP bag. Just know (after you listen to that episode) I did finally conquer sewing on vinyl--woot! It took new needles AND a different thread. I finally landed on the right combination that allowed me to get 'er done. It wasn't fast, and it wasn't pretty, but it was done. Also, develop a really solid list of my UFOs for planning. Did you notice Craftsy is having a flash sale this weekend? Use the banner in the right sidebar of this blog post to check it out! And thanks for supporting this podcast and blog. Continue progress on the "Everything in It's Place" bag from Anne Unrein's class. Get the binding on the D4P baby quilt. Learn two more stitches on my Sue Spargo class project. Got the D4P baby quilt done! It has no name, it has no current destination. But it's done! Got the beads put on the prayer flag. And a few other things done on it besides. Now I just have to figure out what finishing touches I want to do--it doesn't need much, though, so it won't take long. Learn two more embroidery stitches. I learned three, actually--woo! I finally finished lesson four. Took awhile--lesson four stitches are all pretty time-consuming. I only used one on the project; the other two I practiced but decided I didn't want to actually use them yet. The cast-on bullion stitch (at left) is pretty but very similar to the bullion stitch I did last time; so, since it takes even longer than the bullion stitch, I wasn't in the mood to do it all again. I did one to see how it looked, then cut it back out of the project. I may do one down the road as I still have a heck of a lot of project to embroider, but right now I wanted to do something different. By the way, being able to slow the video down to 1/4 speed and put it on 30 second repeat helped a lot when I was trying to coordinate my thumbs for that cast-on stitch. Not being a knitter, that isn't something I've done much and she whipped hers off pretty quickly. After watching her do it very s-l-o-w-l-y several times over I finally got the hang of it. The drizzle stitch is darn cute (at left) but doesn't really work on this current project so I did one for practice and then cut it all off again. Good to know for the future, though. Yep, it's supposed to look like a wad of knots, basically, though generally it would be neater than this. You can't quite tell in this photo that it's 3-D--the stitches hang off like hair or fibers or some such. Cute in the right place--not right for my project. I cut these off when I was done practicing. Finally, the third stitch was a keeper on the project this week. The double cast-on stitch is also very, very time-consuming, but pretty cool, and I was able to use it in a very limited space so I wouldn't be working on it for the next three years. I didn't get mine touching each other the way I'd have liked to--it was a little hard to see where my needle was coming out in comparison to the completed stitch before it. And I still need to work on evenness, but that all comes with practice. It's also a matter of learning how your thread will behave. This one was variegated in such a way that it divided in half color-wise, which was kind of neat, but now I know how to picture that ahead of time as I'm choosing threads in the future. She has several examples of how she's used this in various ways (as she does with all her stitches) and this one has great possibilities for other places on my project. You may see more of this one later. As for the Anne Unrein purse project? Well, not so much. I looked at it the evening I finished up the baby quilt but decided the next step is not one I can leave half-done easily, and since I'm about the head out of town, it's better to be left until I'm home. So it's on next week's goals--but this time I hope to get it finished! And yes, it did help listing my goals like this. Mostly, it got finishing that baby quilt stuck in my head until I finally just sat down to knock it out! I'm actually on the road as this posts (waving at you as I drive by). I don't get home until Thursday, but I have Friday as a comp day. Friday evening my husband and I need to clear out of the house for a couple of days as my daughter is turning it into a weekend boarding house for her and some of her buddies attending a Comic-Con in the area. We're just staying in town because we've got some things to do locally, so it's not a terribly exciting weekend away, although we'll make the best of it! In any case, I won't have access to my sewing room for the weekend. For all those reasons, my goals are small, and largely involving embroidery that I can bring with me on the weekend jaunt. 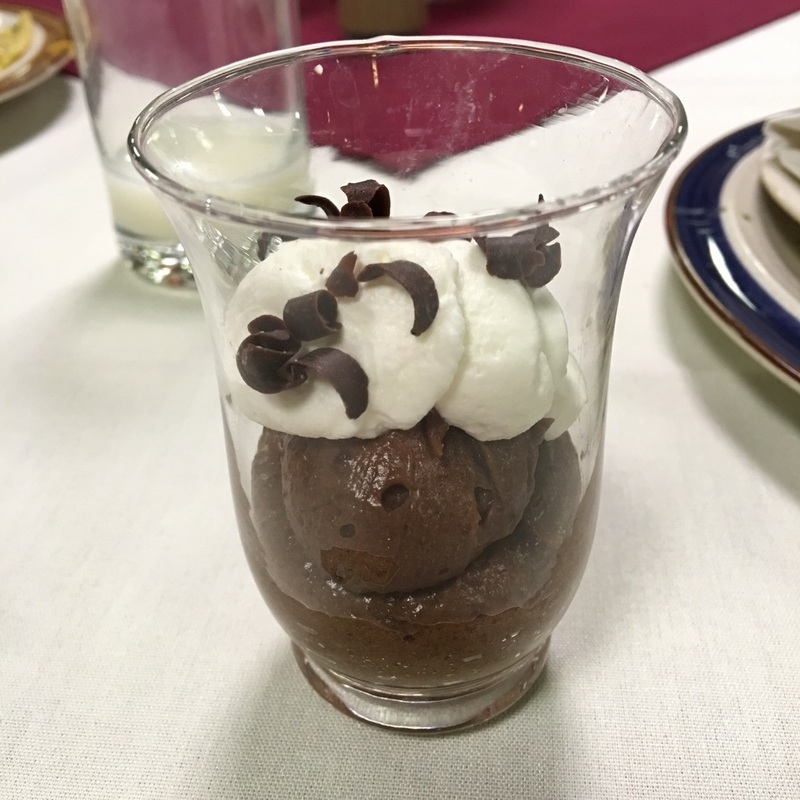 Yeah, I know--I'm entitling this blog post for April 5, which was yesterday, even though I'm writing it today (April 6, Monday). 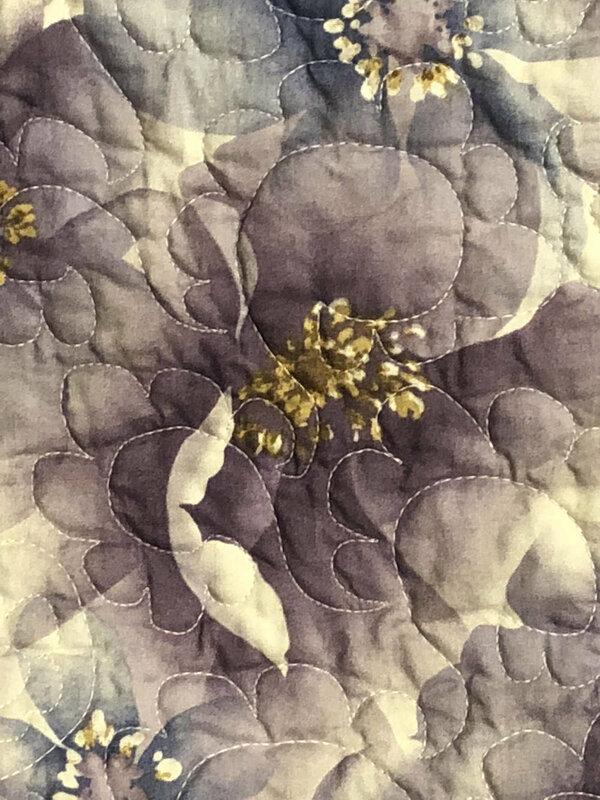 But for some weeks now I've been thinking I should take a page from the books of Jackie at SewExecitedQuilts.com and Philippa from Ozzypipquilts.com and do a post every weekend in which I recap what I've gotten done and set goals for the coming week. That just seems so nicely organized. And I've just become so...well...disorganized. I've been all over the place is my quiltmaking lately and it's time to settle down and move some projects through finishing stages to get them off my cutting table, design wall, or shelves where UFOs go into hibernation. I'm thinking Jackie and Philippa have a good idea--doing a weekly report on my blog may keep me on target. Or, here's hoping, anyway. Mug Rug for Sandi at Quilt Cabana Corner's Mug Rug/Potholder Swap--I know what fabric I'm using, and have mentally toyed with several designs. I need to settle on one and execute. April Journal Quilt--no definite thoughts about this one yet, although see art quilt design class-related list of projects below--one will likely become the April journal quilt. March JBBOM block--the fact I'm a couple of months behind on this is really stressing me out. I need to devote a couple of days to catching up again. March Journal Quilt--it's partly done; I probably have another couple of hours of work to do on it. Two bags for Anne Unrein's Craftsy class--first bag is in progress. It's taking a long time. And I had my first temper tantrum over it earlier today. But I'm not giving up! Prayer flag--needle-felting and embroidery project that I haven't talked about yet because it was purely spur-of-the-moment; it should only take about an hour of embroidery/finishing. D4P baby quilt--just needs binding. Really? And it's sat for this long? Duffle bag--probably only has about an hour or so left of work to be done. Color and Curves class project--working on border, then needs quilting/finishing. Probably would only take a few hours to finish, all in. African Star Quilt--the one I did in Ami Simms class in Lancaster last spring. 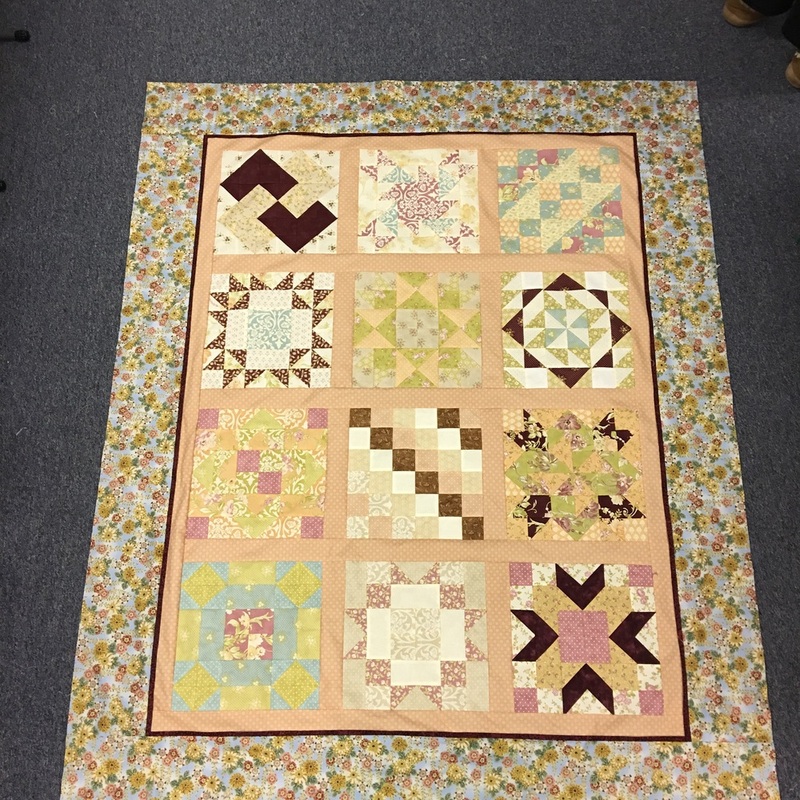 Needs quilting/binding. I want to quilt this one myself. Scrap-in-a-Box--I did most of mine last spring/summer when I was pattern-testing, but didn't finish it once everything moved to Charlotte's blog and I was no longer responsible for the reveal, LOL. I've had breathing room while everyone caught up, but I think next month y'all will be caught up to me, so then the pressure will be on to actually finish it in my lifetime. Art Quilt Map--stalled, went after it with a rotary cutter and completely changed direction, then ended up sort of backing myself into a corner. Need to make a decision about the future of this one. Jelly Roll Sampler--I think all my blocks are made. I just need to decide sashing/no sashing, then get the top pieced and send it out for quilting. This is something that will be a gift for someone who is likely to redecorate before I ever get it done. Need to just get it done! Fibonacci Sequence Quilt--my own very simple design using Fibonacci Sequence. Strips all cut, one block done, another block completely messed up. Need to decide if I'm finishing this or not and if so, figure out what I did wrong. 2008 Guild BOM--blocks all done. Have to decide sashing/no sashing, then get top pieced and send it out for quilting. Katerina Project--this one is an ancient UFO, probably over 10 years old. My own EQ design to use a fabric collection my Mom gave to me for Christmas that year. Some of the finished block sizes were way off, though, so it got set aside. Now I'm no longer in love with the fabric but there's still a lot of sentimental attachment to the project due to its connection with memories of my Mom. Need to decide what I want to do about this one. This one's a little embarrassing, but do y'all remember the Hexie Challenge I did with Pam and Jaye, and I only ever got my Hexies cut out? They're still sitting in that bin. Hmmm. Laurel Burch wallhanging--have had fabrics for-freakin-ever; keeping it simple in design. Need to just get 'er done. Hand-dyeing colorways--I want to start working my way through the Ives color wheel and dye sets of fat quarters in every color, several shades/tones/tints of each. That's a long term project but there will be immediate benefit since I'll immediately have new fabrics to put into projects as soon as I get rolling on it! I'm not yet including in this list the recent UFO I inherited from Vicki (I talked about this an episode or two ago), nor a set of blocks I inherited from Mom years ago that still haven't landed in a project. Those just need to brew for awhile before I worry about getting them on any official list. Some UFOs just don't jazz me anymore, and I'd be finishing them just to finish them. And there's not enough time in the day for that kind of nonsense. 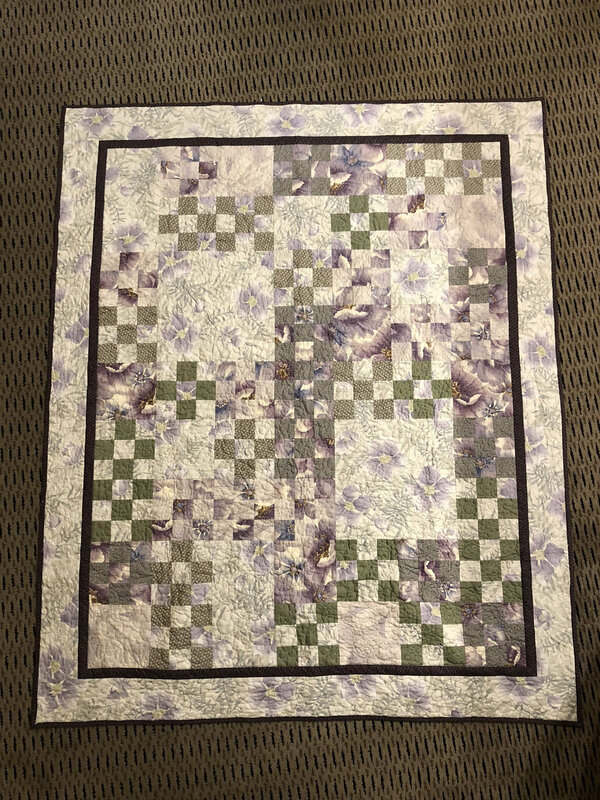 I'm not big into obligation quilting--if I'm going to spend what little, precious time I have in my sewing room on a project, it's one that's really going to jazz me. So there are certain UFOs I think I'm ready to just send on to someone else. I'll ask around at my guild to see if someone wants these. Bow tie blocks--I was playing with a technique I'd learned when I was out on a speaking engagement. I thought it would be a great way to use up 5" squares, which it is. I've got something like 12 or 13 blocks done--just enough for a wheelchair quilt for a guy. It probably wouldn't take all that long to finish, I just have zero interest in putting any more time into it. Someone may love these blocks and enjoy putting it together. Snail-trail top--I believe this one dates back a couple of years to when I was doing creativity challenges on my podcast. I vaguely recall this was my start on the warm color challenge--I did a background with snail trail blocks in black and sort of a taupe-y fabric. The intent was to do applique flowers on the top in oranges/yellows. The background is nice enough but I have no interest in finishing it at this stage. There may be others I decide to send away to new, loving homes, or ditch altogether if I've learned what I need to learn. These are just the ones I've run across recently that I immediately thought, "Nope, not interested." Oh, I'm so sure I'm missing something on this master list. But it's enough to make me feel overwhelmed so here's to starting to chunk away at it. I'm home most of the week, though after today I'm back to work. I'm out Tuesday night but I think that's it. I'm gone next week, though, so I'm keeping my goals very limited until after I get back from this next work trip. Then I've got a few weeks of a fairly low-key schedule so I hope to make significant progress then. Continue progress on the "Everything in It's Place" bag from Anne Unrein's class. Unlikely to get it finished, but would like to at least feel good about where I'm at. Get the binding on the D4P baby quilt. I mean, really. Can't believe that's still sitting there. Put beads on the prayer flag so it's easier to travel with--I'll bring this with me on next week's trip because it's very, very small and easily portable. That I really, truly, am a machine girl. That hand-piecing and hand applique are just not really my cup of tea. That, however, I do like doing felted wool with a blanket stitch by hand. Just not in several layers with a honkin' big chenille needle that hurts my fingers trying to get it through everything. How I'm finally narrowing in on being able to start my embroidery for the Sue Spargo embroidery class (not the "Sue Spargo Take 6 Weeks to Finish Your Background" class). That I'll find out then whether I'm an embroidery girl. How I have a few too many projects clamoring for my attention at the moment. How much I'm looking forward to going to a class on Saturday with a bunch of my peeps. How it's been way, way too long since I've gotten to spend time with my Guildy-Girls. That, on the other hand, I've gotten to spend time with a few of them in our Design Study Group this week. How much fun Design Study Group is. Especially when someone brings in a project for a consult. And we can all gather around and discuss design principles and voice opinions. That it'll be fun to see what they do with the art quilt design classes we're all taking the next couple of Saturdays. How that brings me back to looking forward to going to a class with my quilty peeps. How that almost makes it better that there's still piles of snow outside that haven't melted enough yet for us to even see pavement. How the forecast doesn't look good for the next several days. That at least "March 1st" means "Getting closer to spring," so I'll be celebrating that day even if it is supposed to snow. That even the Doofus has an opinion about the weather. Nope, it didn't convert me to hand-piecing. It came out to around 9 1/4" instead of the required 9 1/2", something that a lot of people in the class said in their message boards, so it's a common issue. I had measured my PDF print-out of the templates quite carefully, so that wasn't the problem. 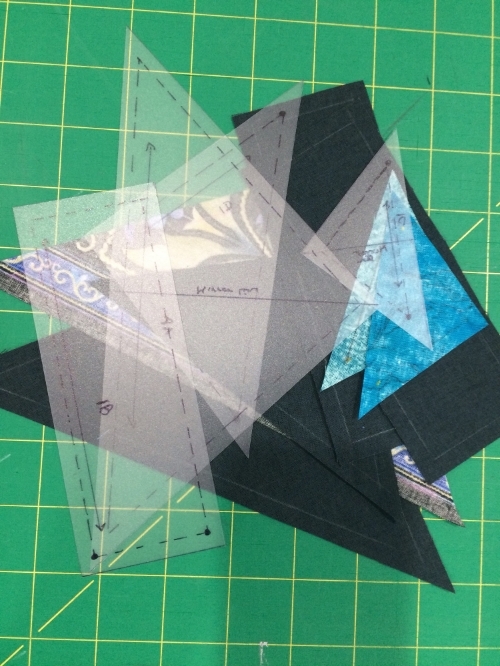 I suspect it had to do with the multitude of error possibilities in the template process that I talked about on my podcast, plus when I was hand-piecing I was stitching right on the lines, whereas perhaps I should've been doing scant seam allowances instead. Who knows? I'm very tempted to rip it all out and re-do it by machine to see if I could get it closer to the required size, but I've decided to wait until after February's blocks--there's two of them--to see what size those measure out to. There are some bias edges involved, and I don't think I've got enough fabric to recut pieces, so it would be almost more of a risk to take everything apart and re-do it. Hence, pushing the pause button and adopting a "wait-and-see" attitude. I'll be doing February's blocks by machine. Although I did get into a groove and had pretty even stitches after the first couple of pieces, I just didn't find the process Zen enough to warrant taking that long on a single block again. I withheld my final judgment until I saw the finished block--I was willing to decide it would be the way to go if my final block were somehow a better or at least equal product to what I can do by machine. Ahem. Nope. Yes, it's possible to sew a piece on upside down even when "slow quilting" (snail's pace) by hand. At least it's easier to rip the seams out! I know, I'd get better and more accurate if I kept doing it by hand, I'm sure. But here's the thing--ya gotta wanna. I'm not sure I'm particularly interested in becoming an expert hand-piecer. I'm still doing hand-work with the embroidery, so I've got plenty of TV-ready work to do. Meanwhile, I'm a machine-piecing-girl at heart, as it turns out. Not overly a surprise. Meanwhile, I've got some snow-dyeing happening in the basement. Feels good to be playing with dyes again! So this cold that's had me down for the week took an interesting left turn this weekend. I had already cancelled out of a couple of things so I could spend most the weekend resting and recuperating. I had a couple errands to run but otherwise was pacing myself with time in my sewing room alternating with time on the couch. I felt some slight improvement by last night so I had high hopes for today. And then this morning (Sunday) I woke up with what I strongly suspect is pink eye. I've never had it myself, but my kids did when they were little and a quick check of the Internet confirmed my symptoms. Still, I'll be calling my doctor in the morning to be sure. Fortunately, it's not too bad--my eye's a little swollen but it's not really bothering me much in terms of pain or anything. The biggest impact is that I consequently had to quarantine myself. My husband got groceries instead of me (love that man), and I carry disinfectant wipes with me everywhere I go to wipe down any surface I touch. I've had a hand towel tossed over my shoulder all day for drying my hands so I wouldn't use any of the bathroom towels. I had DH pick me up a box of latex gloves so I could help put away some of the Christmas decorations and then tonight, when my son and a friend, and my nephew and his girlfriend, showed up to play games, I could participate safely. I call it, "practicing safe game." Ahem. But for the most part, I tried to stay sequestered in my sewing room. It doesn't matter what I touch in there because no one else ever goes in that room. I got all the pieces done for the Jinny Beyer BOM. I haven't started hand-piecing it yet. I do think I've already decided I won't be hand-piecing the rest of the quilt. Holy cow. I mean, I'd like to have this done before I'm 95. I also want to shout my thanks to the person who invented the rotary cutter and rulers. I'd never have become a quilter if I had to do it this way. More power to all y'all who started quilting in the days of templates and scissors--every one of you is a better person than I am! It's a fine line between Zen and Tedium. I also got one butterfly--count it--one--of fifteen appliqued on my other Craftsy class project-in-process, Sue Spargo's embroidery class. I'll be blogging more about that class some other time. For now, let's just say I was having thread issues. 'Nuff said. I'm probably going to be working on this more tonight. I had to tap out of game night when talking more than I'd talked for the last several days all together got my coughing started up again, so my nephew tapped in to finish out my role in Careers, and now they're gathered around the dining room table playing Settlers of Catan. I'm having fun just listening in on their trash talking. The other big project I wanted to get done this weekend is now complete. 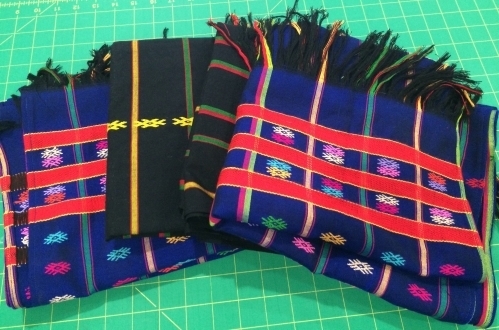 I'd bought two hand-woven fabric pieces from a woman in Myanmar---straight off her loom; I needed to cut each piece in two to turn them into four shawls as gifts for colleagues. I had to hem them up, which was more of a challenge than I thought it would be. I'll talk more about this process on my next episode--whenever that is. In any case, I got those finished tonight too. That felt particularly good--now I just need to get two of them in the mail. The other two go to womenn I'll be seeing this coming weekend. I also knocked out a lot of other things---little niggly things like getting a bunch of printed Craftsy materials organized into a binder, ssome other stuff labeled, a few necklaces fixed, some other Myanmar souvenirs boxed up and rready to get packaged for mailing. I guess I can handle being quarantined.